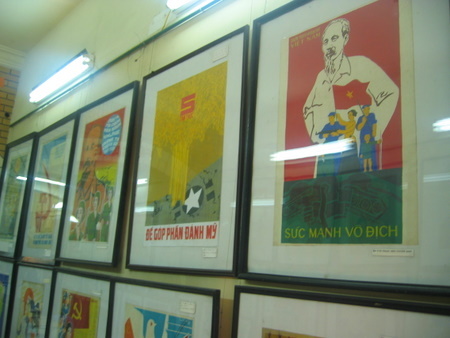 Amongst the tourist trinkets of Hanoi’s Old Quarter is a small shop doing a brisk trade in selling off old propaganda posters from the Vietnam War, providing both history and art as souvenirs for backpackers. 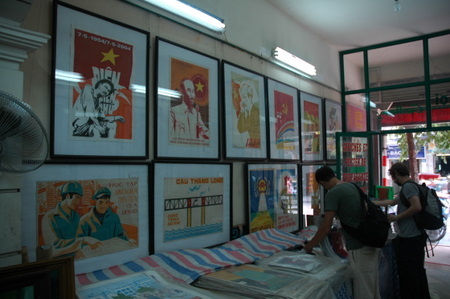 Hanoi has hundreds of shops selling silks, lacquerware, tailor made clothes and all sorts of other handicrafts, but my favourite is this shop on Hang Bac in the city’s Old Quarter that sells hundreds of original propaganda posters and reprints from the American War, as it’s known in Vietnam. 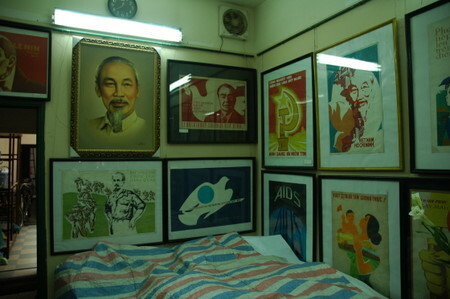 Step into the shop and you step into a time capsule of exhortations to patriotism and defeating the enemy, all under the watching eye of Uncle Ho. 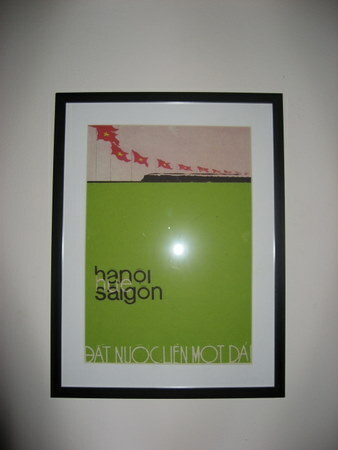 There’s a initial kitsch value to browsing amongst the posters which are stacked 50 deep separated by cover sheets, but flicking through a deeper, more sobering picture emerges of the Vietnamese struggle for survival and independence. 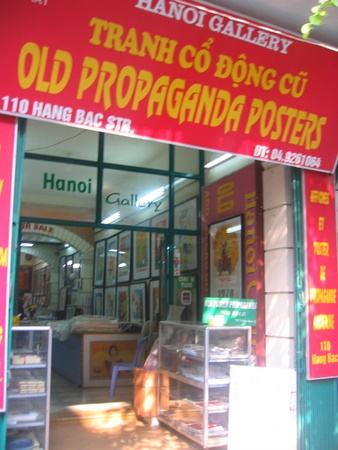 The old lady who runs the shop might well have lived through both the French and American wars in Vietnam. 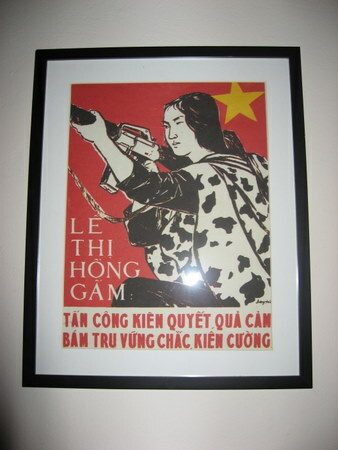 I wonder what she thinks of all these backpackers crowding into her shop to buy these posters that once would have been taken deadly seriously. There are a variety of artistic styles at work, from the blocky Soviet graphical influence to almost impressionistic efforts. 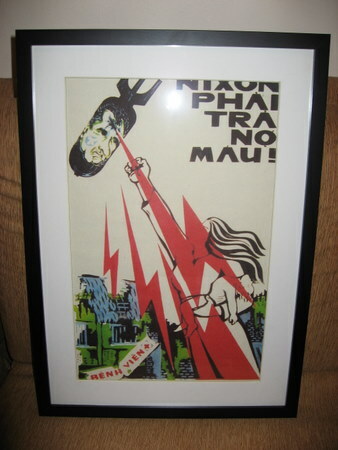 Many of these images are genuinely striking irrespective of their historical impact and as they only cost a few dollars each, you can buy several. 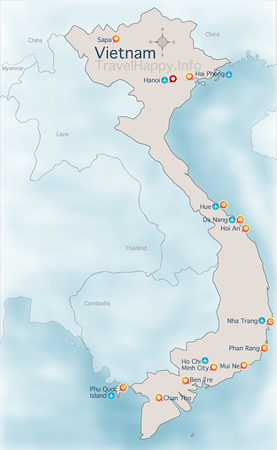 Unsurprisingly, images of Ho Chi Minh, credited as the Father of the Nation who led Vietnam through the war but did not leave to see its independence, crop up frequently. 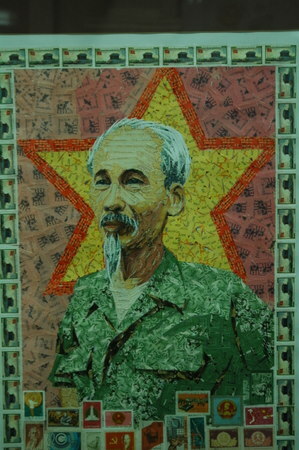 My favourite picture of Uncle Ho, as he’s affectionately and respectfully known to the Vietnamese, is this portrait of him made entirely with Vietnamese stamps.